As a typical female office worker, one of the most pressing dilemmas facing us is what to wear to work. When it comes to office wear, there just seems to be no shop or store out there that have any clue as to what working women actually want to wear. But one brand that does come close is AIIZ, which offers a wide variety of clothing styles, be it formal, semi-formal or casual. 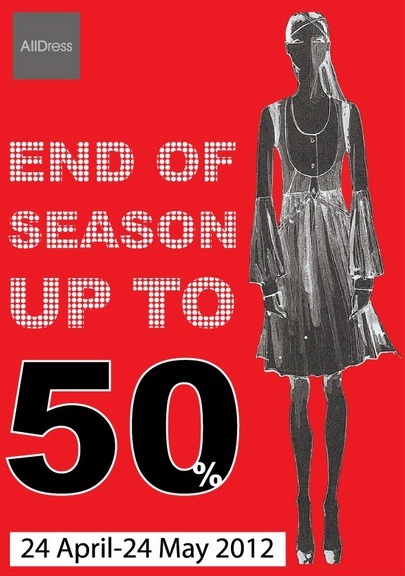 AIIDress, a brand of AIIZ that specializes in, you guessed it right, dresses, is having an end of season sale of upto 50% off at all branches from April 24 to May 24, 2012. You can find their outlets and counters at Paragon, Robinson, Emporium, Zen and The Mall. As a background, AIIZ is a popular clothing brand of the Reno Group which was founded in 1992. It has today become a leading fashion retailer with over 400 stores and outlets across Thailand; and it besides, it also exports to several countries in Southeast Asia and the Middle East. While AIIZ brand is a young casual brand targeting teenagers, "AIIZ Career" aims for the working ladies, and there is also the "AIIZ XII" brand for children's clothing.